A removable partial denture can restore your natural appearance, speech clarity, and chewing. A removable partial denture is designed specifically to meet the needs of the patient and can replace one or more missing teeth. A natural appearance and speech clarity is restored along with the ability to eat more efficiently. Partial dentures are created out of a metal and acrylic composition, completely out of acrylic, or out of a flexible material . A patient’s specific needs and anatomy dictate the design of the partial denture and every effort is made to construct a self-cleansing partial denture that preserves the remaining teeth and oral tissues. For more information, or to schedule a consultation, please call our office in Fairfax, VA at Fairfax Office Phone Number 703-884-2414, or request an appointment online. How are partial dentures made? Dr. Choi and Dr. Choi will design your partial denture so that the chewing forces are evenly distributed over the entire surface are of the remaining teeth and soft tissues. Changes to your remaining teeth may be recommended to help equalize these forces. Metal partials are generally preferred as they are structurally superior. They are thinner and more hygienic than an acrylic partial. The flexible partials do not have any metal so is much more esthetic, especially for patients missing front teeth. Acrylic partials are typically used as a transitional or temporary partial. 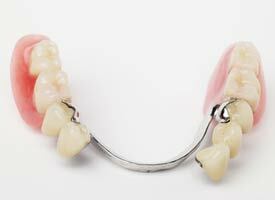 In certain cases, custom partials can be fabricated with a mix of metal and flexible properties. Drs. Choi and Choi will consult with you to determine the appropriate partial for your situation.